I måndags framförde Gene Simmons nationalsången vid Los Angeles Dodgers match. In some alternate reality, Gene Simmons probably anchors a college a cappella group (and still wears that makeup). 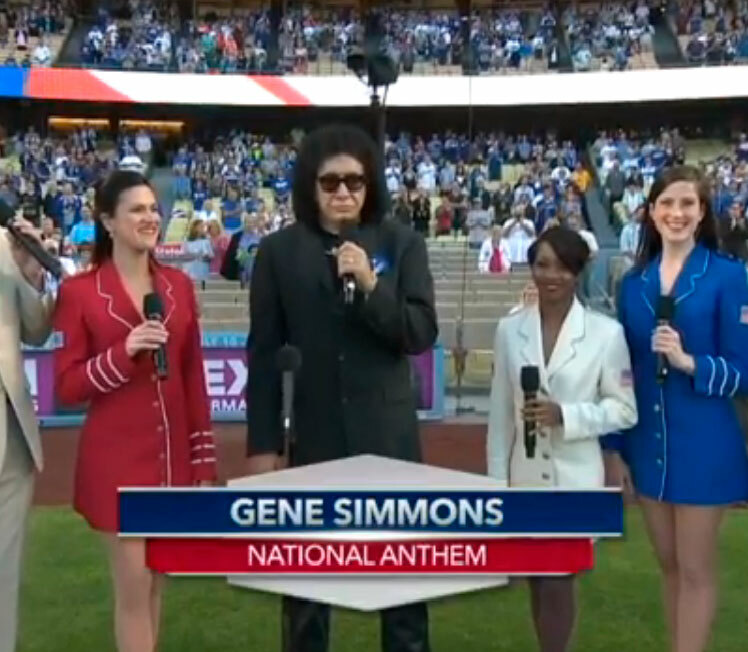 On Monday, the Kiss vocalist-bassist teamed up with some members of the USO for a vocal rendition of the National Anthem ahead of a Los Angeles Dodgers game. With Simmons holding down the low end, the group busted out the kind of rousing harmonies that would make the Statue of Liberty weep sweet tears of freedom. And Simmons made sure to add his own personal touch to the ”Star Spangled Banner,” tossing up some devil horns for good measure. Amidst all his rocking and rolling, Simmons is making another foray into television, signing on as a co-producer of a Lifetime series, Ugly Models, about a U.K. modeling agency that works with ”character models with unique and unusual looks” as it makes its way into the U.S. market. LÄNK OM VIDEON NEDAN INTE FUNGERAR!